Here is an image of three fossils in one place. First is the Vinlandostrophia (Platystrophia) sp. 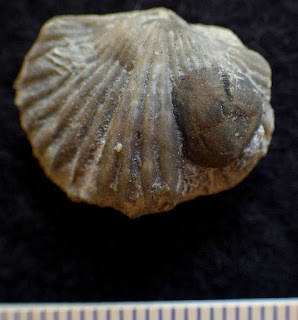 brachiopod with an unidentified inarticulate brachiopod attached. On the inarticulate brachiopod is a Cornulites corrugatus worm tube fossil. These fossils date to the Ordovician Period. They might be from the McMillan/Grant Lake Formation and were found in eastern Jefferson County, Kentucky, USA.